Taking care of your horse riding equipment is a vital part of equestrianism. After all, if you look after your equipment, it'll look after you and really go the distance. Leather saddles are exceptionally prone to damage if they are not adequately cared for. Water especially can cause considerable damage, so keeping your saddle dry is essential if you want it to have a good lifespan. Saddle covers are a great idea and bring with them many advantages, so it's no surprise that most horse-owners have at least one in their kit. 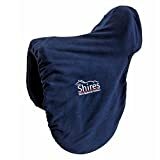 Saddle covers are great to use when you are storing your saddle in order to keep it clean and safe. A saddle cover will cover the whole of the saddle, protecting it from air and water damage and ensuring its continued good condition. Leather saddles need to be regularly cleaned with saddle soap and, once they are dry, putting the saddle cover on over the top will really help to keep it in tip-top condition. Prolonging the life of your saddle is very important and will ensure that you don't have to worry about the cost of replacement before you absolutely have to. Saddle covers don't just come in handy when the saddle is not in use. They are actually great for when you are out riding too, especially if rain is forecast. No passionate rider wants rain to put them off a good ride, however the risk of damage to the saddle is too much to take. Using a ride-on waterproof saddle cover means you can head out into the great outdoors with your horse come rain or shine. These come with slits for the stirrups to fit through. 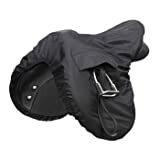 A waterproof, ride-on saddle cover is best if you like to head out on a hack in all the elements. 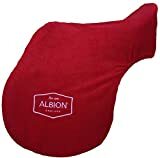 However, if you are just planning to use your cover to protect your saddle when it is being stored then you may wish to opt for fleece or nylon instead. One size generally fits all when it comes to saddle covers, so whichever design you pick should fit neatly over the saddle. Saddle covers are available in every colour you can imagine, so you are sure to find the perfect style for you and your horse. Fitting your saddle cover couldn't be easier. They are generally elasticated and simply pull over the saddle in one quick and easy motion. When it comes to cleaning a saddle cover, it's as easy as throwing it in the washing machine (although be sure to check the care instructions as certain types will need to be hand washed). Cheaper saddle covers tend to start from �8-�10 however if you are looking for something that will last then you are better off spending around �20 for a top quality design. Make sure the saddle cover that you choose meets all your needs and you can be sure that it will look after your saddle for a long time to come.